Nurses working with the WHO (World Health Organization) administer the Ebola vaccine to a local doctor in Mbandaka on May 21, 2018, during the launch of the Ebola vaccination campaign. The Ebola outbreak that has killed more than two dozen people in northeastern Democratic Republic of Congo could be as devastating as the one that hit West Africa several years ago, if left unchecked. But first responders say things are different this time. That’s in large part thanks to a vaccine they couldn’t use in late 2013, when Ebola cases were first reported in Guinea. The pharmaceutical giant Merck has shipped about 8,600 doses of its experimental vaccine, V920, to the site of the outbreak in Equateur province. The drug has gone through Phase 3 trials, but has not yet received regulatory licensure in any country. 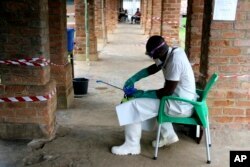 It will be administered in Congo by the World Health Organization, a Merck spokesperson told VOA. Having an effective vaccine isn’t enough, the head of policy and health diplomacy at the Africa Centres for Disease Control and Prevention, Dr. Benjamin Djoudalbaye, told VOA by phone from Geneva. V920 isn’t designed for mass vaccination. People who have come in contact with a patient must be identified and given the drug. 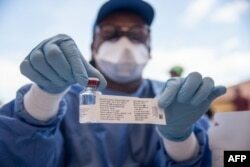 A nurse working with the WHO shows a bottle containing Ebola vaccine in Mbandaka on May 21, 2018. The WHO will follow the “ring vaccination” approach, wherein anyone who has come into contact or may come into contact with an infected person is vaccinated to contain the threat. This could include family members, funeral workers, health workers and others in close contact with a patient. So far, V920 has prevented everyone vaccinated from contracting the virus. In a 2015 trial, none of the 5,837 people who received the vaccine became sick. A Merck spokesperson said in an email that the company plans to file for licensure in 2019, but it has made the vaccine available due to the Congo outbreak. The WHO has requested an additional 8,000 doses, and Merck said it is working to fulfill that request. On May 18, the East African Community regional bloc warned its members that the virus could potentially spread from the DRC due to direct flights between the countries and extensive trade relations. A health care worker wears virus protective gear at a treatment center in Bikoro, Democratic Republic of Congo, May 13, 2018. “Five out of six EAC partner states share borders with the DRC, and all of them maintain close trade relations with high border traffic,” the statement alerted. The WHO has not declared a state of emergency, and travel to and from the DRC has not been restricted. But Djoudalbaye, who just returned from the DRC, said there are no sure things in disease control. It’s just a matter of lowering the risk as much as possible. “The risk ‘zero’ doesn’t exist,” he said, “That is what we need to have all keep in mind.” But strong action from the government can limit the disease from spreading, he added. Djoudalbaye says health officials, NGOs and governments learned many lessons from the West Africa Ebola outbreak in 2014 and 2015, including the importance of a health-response infrastructure to support rapid intervention. Key to that effort has been the Africa Centres for Disease Control and Prevention, which opened in early 2017. FILE - A photo released by the World Health Organization Oct. 22, 2014, shows the receipt by Geneva University Hospital (HUG) of a batch of the experimental rVSV Ebola vaccine developed at the National Microbiology Laboratory in Winnipeg, Canada. V920 isn’t new. A team of scientists led by University of Manitoba researchers Steven M. Jones and Heinz Feldmann invented the vaccine in 2003 at the Public Health Agency of Canada, in Winnipeg. Initial tests showed promise. Just one shot of the vaccine prevented macaque monkeys exposed to high levels of Ebola from getting sick. But development of the drug faltered. Lengthy, expensive clinical trials didn’t happen, until the worst Ebola outbreak in recorded history unfolded more than a decade later, in 2014 and 2015. By then, the vaccine had been licensed to Merck, and its effectiveness in humans had been established. More than 11,000 people died in the West Africa outbreak four years ago, and nearly 30,000 cases were recorded, mainly in Guinea, Liberia and Sierra Leone. Trials of V920 in the outbreak region helped reduce the caseload and ultimately stop the epidemic. 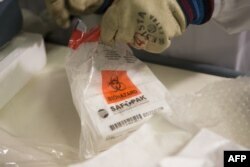 Keeping the virus contained and the death toll as low as possible will require ongoing funding, experts say. “If funding is cut, it will really be pulling the rug out from under health security. And countries that look to other countries that can help will be left alone again as these things will continue,” said Cyrus Shahpar, the director of the Prevent Epidemics team at the Resolve to Save Lives initiative, a New York-based organization working to manage disease threats. “The spread hasn’t gone away. Obviously we have this new Ebola outbreak, but I think that the memory of what happened in West Africa has kind of waned a bit, and so funding is also starting to wane. And I think it’s absolutely the wrong thing to do,” Shahpar said.